The last days of October finally brought some rain to Los Angeles. 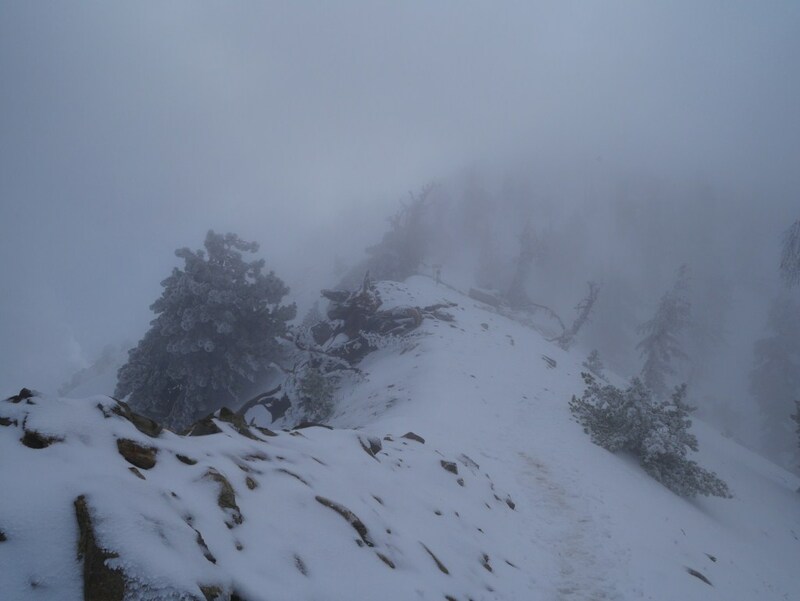 This first storm of the season yielded enough precipitation to allow for a substantial snow hike. However, I wasn’t sure of that when I left my house last Sunday hoping to find myself in a winter wonderland. 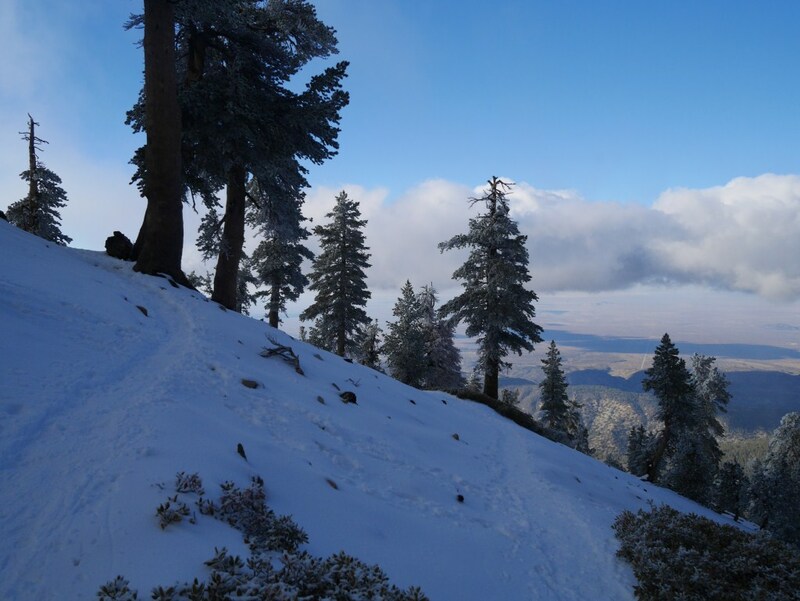 As a result, I headed up Angeles Crest Highway with several options in mind for potential snow hikes. 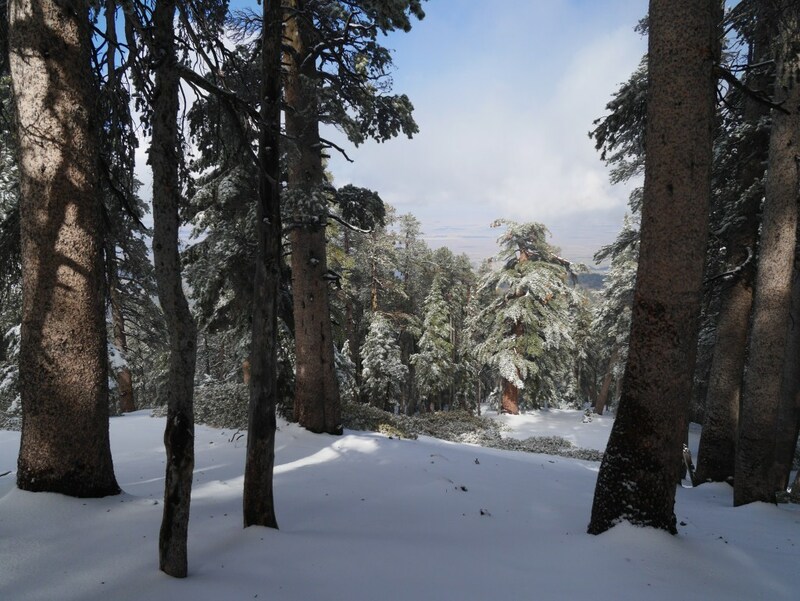 Although I thought it was possible I might find very little snow, I brought my microspikes and snowshoes with me so that if I found icy or deep snow I wouldn’t need to turn back as I did last year above Limber Pine Bench. View from the summit trail leading up to Mt. Baden-Powell. I decided to hike the Pacific Crest Trail from Vincent Gap to Mt. Baden-Powell. This was in part due to the fact that I hadn’t hiked that section of the PCT in snow yet. Also, while I could see the peaks along the way were in snow, their associated trailheads were not. With Mt. 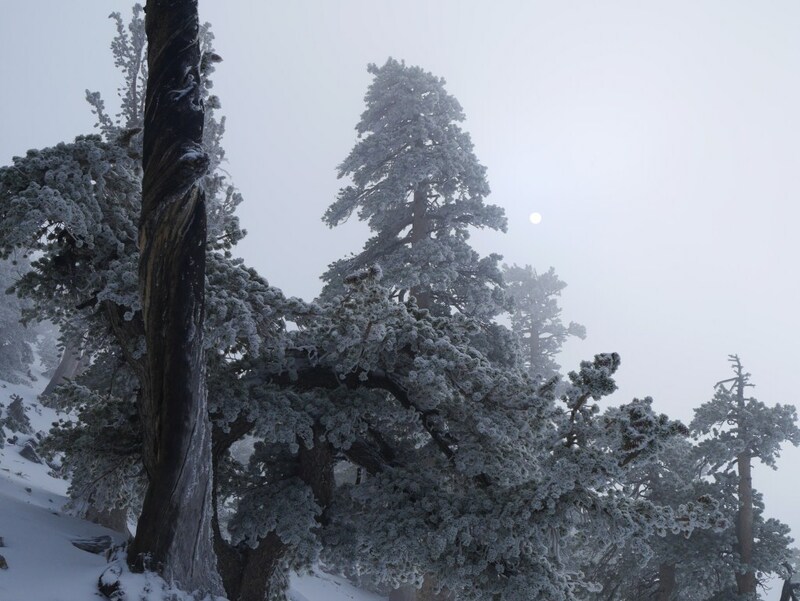 Baden-Powell (at 9,399′ in elevation) being the highest peak reasonably accessible as a day hike from Angeles Crest Highway, I felt the trek from Vincent Gap would give me the best shot of being continuously in snow deep enough to sink into without reaching soil. It turned out to be a good decision. With the exception of a small stretch along a ridge, numerous switchbacks connect Vincent Gap to Mt. Baden-Powell. This section of the Pacific Crest Trail is moderately strenuous and is used by many as an early season training hike for the Mt. Whitney Trail. The key reasons for that are; the trail is at high elevation, it follows a large number of switchbacks up one face of the mountain similar to the path covering the 99 switchbacks from Trail Camp to Trail Crest, and it has an average grade of 750′ per mile which is steeper than the 590′ per mile average grade of the Mt. Whitney Trail. What makes this hike moderate is it’s comparatively short length of 7.6 miles round trip. One of the few flatter areas of this section of the PCT provides a good place to make gear changes. 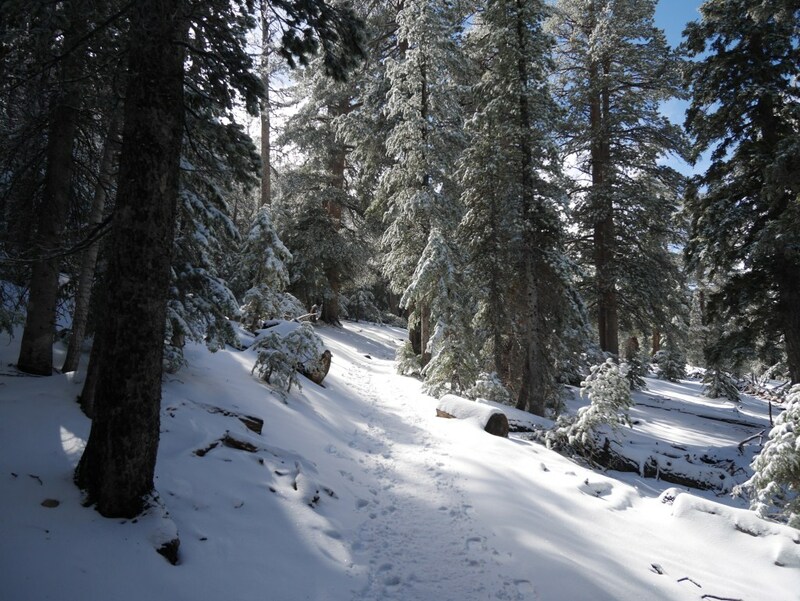 The trail is well maintained and was easy to follow in the snow throughout. It is also a popular trail, so there were numerous people there before me whose footsteps also helped to lead the way. Although there was no snow at the trailhead, about a mile and a half up the trail the snow was deep enough to provide a continuous hard packed ground cover. At that point I stopped to put on my microspikes. With the sun melting the ice from the trees, it sometimes felt like it was lightly raining as I walked under them. View toward the Mojave Desert from the Pacific Crest Trail. The switchback nature of the hike makes changes of views to be mostly about getting a higher perspective of the same panorama or up close changes in the dominant species of pine tree that takes place with elevation gain (Lodgepole and Limber Pine being my favorites on this trail). A little over halfway up the trail I found myself moving from sunlight into clouds as they were making their way around the mountain and heading out over the Mojave Desert below. Visibility now being low, I found myself preoccupied with the snow and icicles which had formed differently on the trees, branches, and needles. The colorful bark of the limber pines stood out more against a grey background and icy snow covered needles. Most of the rest of the way up the mountain involved constant transitioning between being in the clouds with low visibility to moving outside of them into the sunlight with a long view out to the desert below. Numerous pockets of differing degrees of mist between those extremes yielded subtly lit landscapes with engrossing interplays of sunbeams, light, and shadow. Heavy mist from the clouds makes the Wally Waldron Tree (center of photo) and Mt. Baden-Powell barely discernible. The day was filled with dramatic visual experiences as the clouds sometimes moved swiftly over and around the mountain. A stunning example occurred over a five minute period as I approached and reached the Wally Waldron Tree. At first I could barely see it through the dense mist of the clouds and Mt. Baden-Powell was barely discernible. Within five minutes I was at the Wally Waldron Tree and the lower clouds had already moved away opening up the view to a misty sunny sky. Within five minutes the clouds moved away allowing the sun to break through. Still a little misty and softening the view of the sun, the difference was intensely uplifting. The splash of blue, the snow appearing more white than grey, and the view of the peak beyond were striking developments over so short a time period. View looking south from Mt. Baden-Powell. It was clear and the air was surprisingly still on the peak given how fast clouds were swirling around it. Although the view out was blocked these clouds (I couldn’t even see Mt. Baldy), the drama of the quickly changing light and cloud shapes made the experience wonderfully exceptional. Sun breaking through and softened by the mist on the way back down the mountain. The trip back down the mountain provided similar experiences as the clouds never burned off while I was there. It was another phenomenal day on the mountain. Days like this always leave me thankful that I discovered this forest in Los Angeles which is just as easy to get to for many Angelenos as the beach is. Additional photos: Mt. Baden-Powell, Pacific Crest Trail. 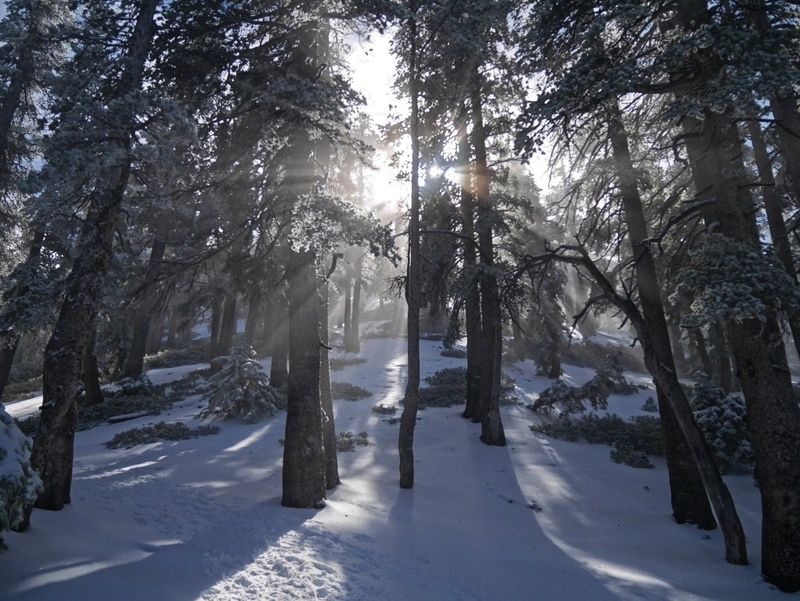 This entry was posted in Landscape Photography, Snow Hiking in Los Angeles and tagged Mt. 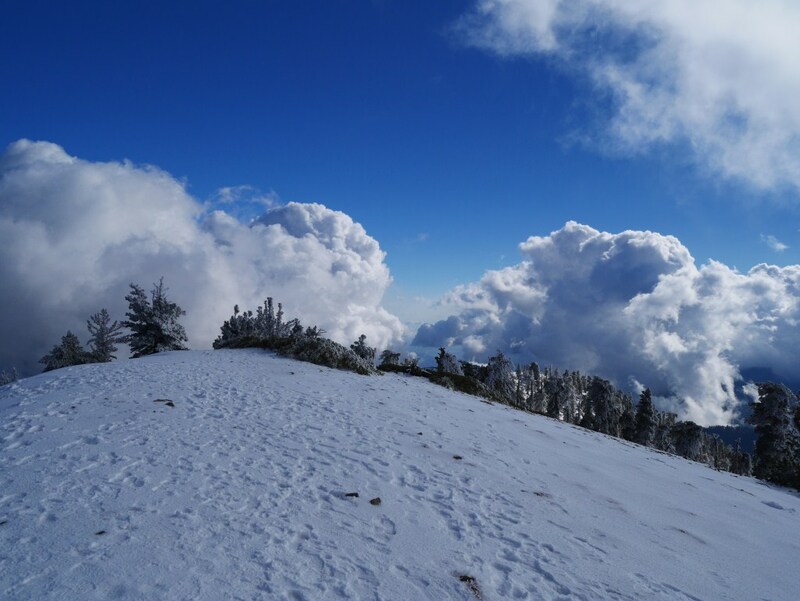 Baden-Powell, Pacific Crest Trail, snow hiking, Vincent Gap by Kyle Kuns. Bookmark the permalink. Hi, I was wondering about permits. Did the Rangers allow you to hike in the snow? No permits required to hike in Angeles National Forest. 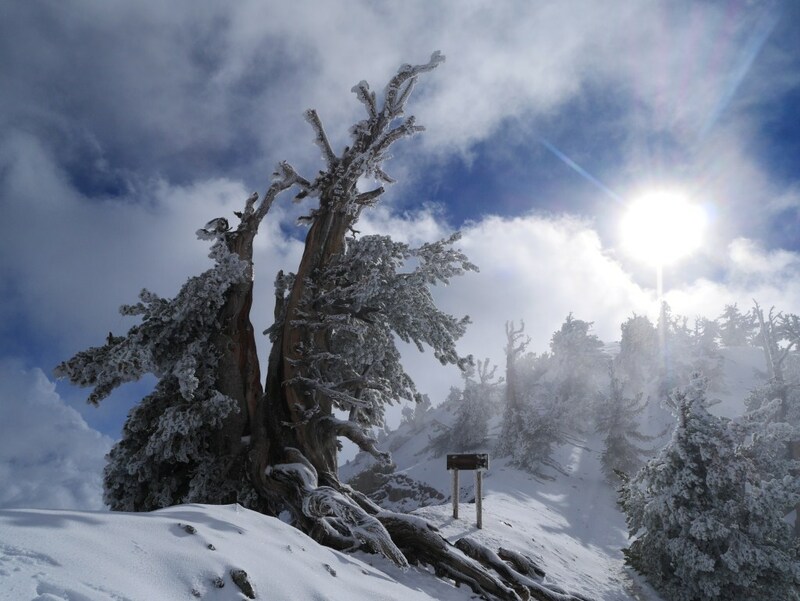 Your photo of Wally Waldron Tree and the lower clouds seems other worldly. I am an avid backpacker but have still to go snow hiking. What type of footwear were you using. Did you bring along krampons or snow shoes? I used microspikes because the snow wasn’t that deep. In deeper snow I use snowshoes. It there’s a lot of elevation gain on a snow hike (e.g. Mt. Baldy from Manker Flats), I start out with microspikes for the more shallow icy areas and carry snowshoes in my pack in case the snow gets deep at higher altitude (which it often does above the ski hut). 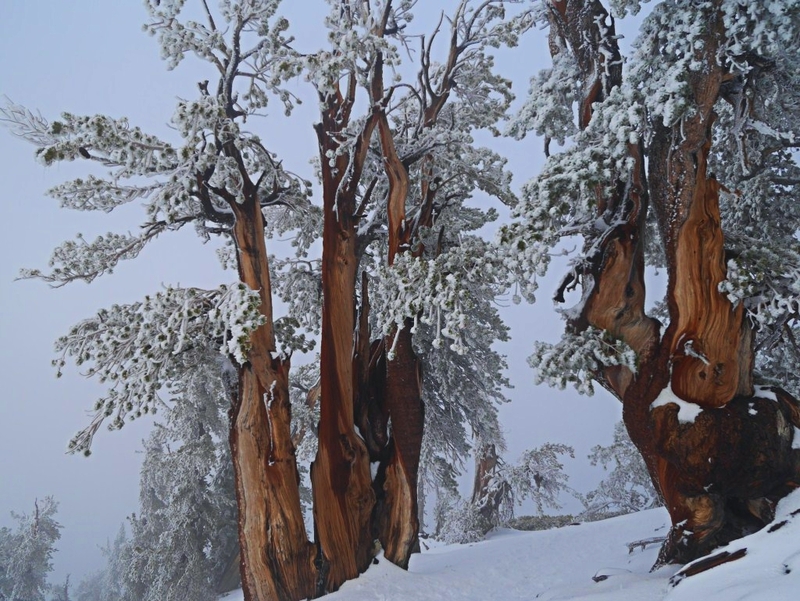 Wow, those photos of the Limber Pines are beautiful. What kind of camera do you use? One of these days (not when there’s snow) I’d like to get my husband up there to Mt. Baden-Powell, just because he’s an Eagle Scout. Thanks. Limber Pines are one of my favorite trees. Mt. Baden-Powell is great in the summer, I’m sure he’ll enjoy it. I’m using a Panasonic GM-1 with the kit lens. It’s a recent purchase. I’m very slowly trying to learn some manual options rather than going with the point and shoot I’ve done until recently. My real goal is to learn how to take night shots when I backpack. I’m still using the automatic settings most of the time though. Great post, Kyle. I’m glad to see you back at it more. That’s a tough hike, but worth it. The Wally Waldron tree looks a lot different in the snow than it did in the heat of summer. Thanks. I always enjoy seeing the snow version of the trails I know well from summer hiking. Hopefully we will get a lot of snow this winter and I can finally remain injury free. Friends had gone up to BP on Saturday but I wasn’t able to go. I saw photos and made it a point to go up Sunday. On Sunday morning my plan changed, I took a shorter hike up to Throop Peak from Dawson Saddle and was able to experience just as much snow with less cloud coverage. It’s really a great experience ! That’s a great hike too. I was thinking about that one myself, but I’d hiked Mt. Lewis and Throop Peak the week before and I rarely hike the same trail again so soon. I hope this is a preview of lots more storms this year! 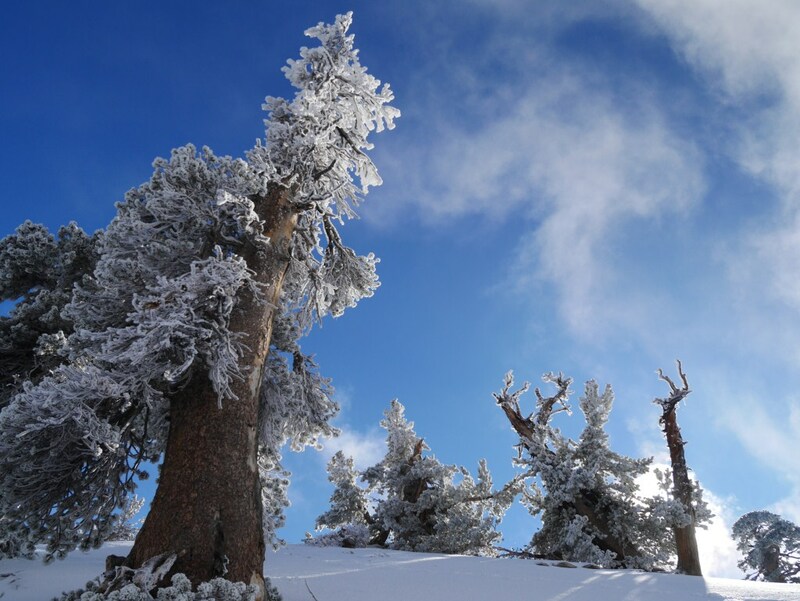 I love the picture of the Limber Pines!